Your grandma is cut from the same cloth as my dad, whose version of vegetarian was just taking the meatballs out of the sauce. I never went “full vegetarian” but I do eat far more plant based meals then my family growing up. 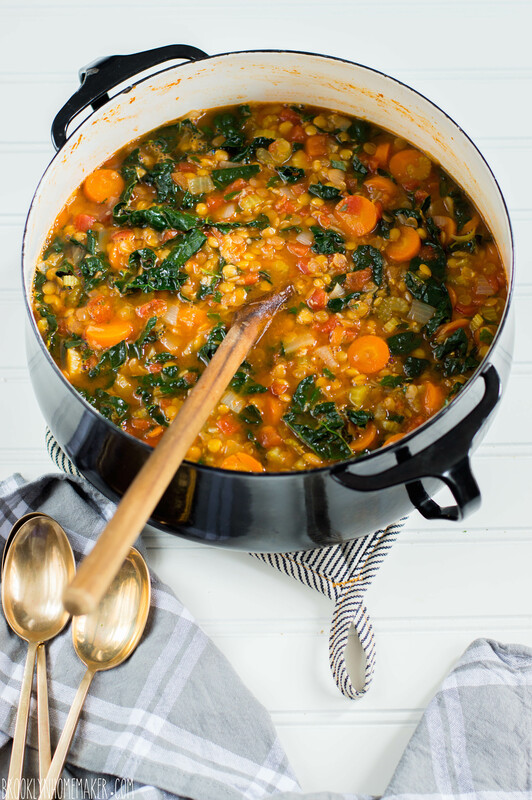 This soup looks perfect to hunker down with on this cold, cold weekend. cheers! Hahaha sounds about right! I definitely eat a lot more vegetables now and eat lots of meat free meals now that I probably never would have eaten before. 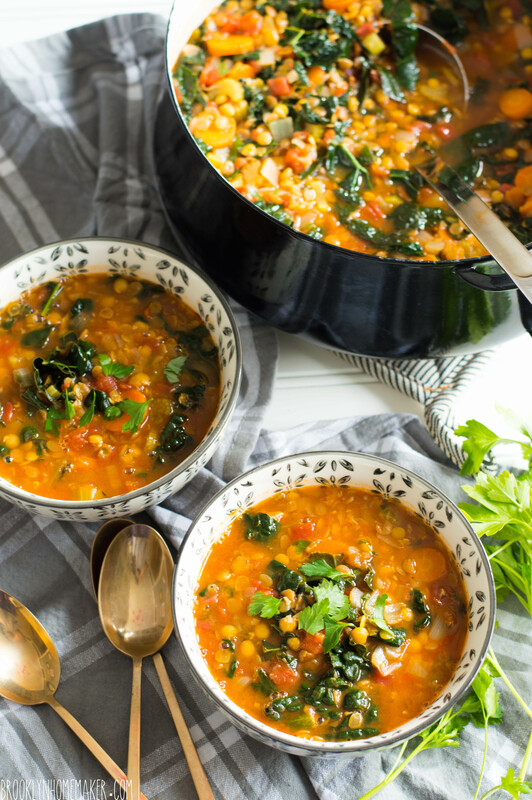 This weekend is definitely going to be the perfect weather for a soup like this! Oh Happy Valentine’s Day to you both! Thank you so much! 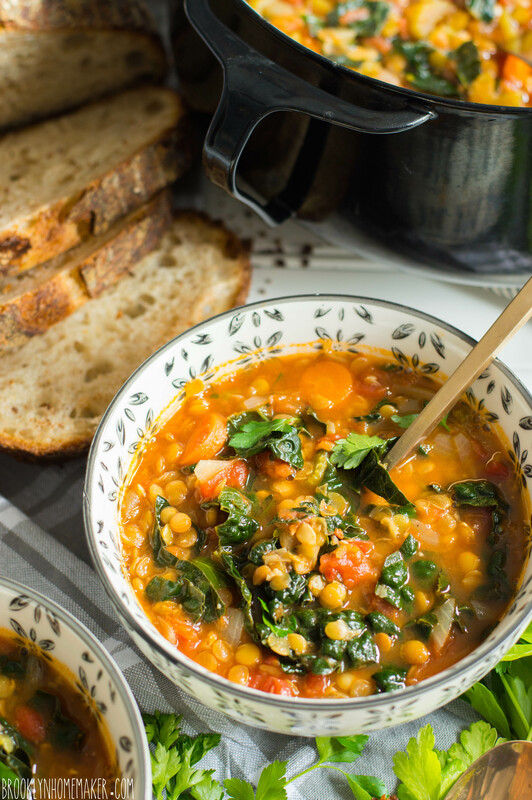 They definitely did a lot to give this soup a great flavor, but part of the reason I wanted to try to add tomatoes and kale was to have some contrasting colors and texture. Definitely did the trick! haha! My family were similarly puzzled when I went vegetarian nearly 6 years ago. I come from good Danish and Tasmanian farming stock so they had no idea what to do with me! Hahaha! 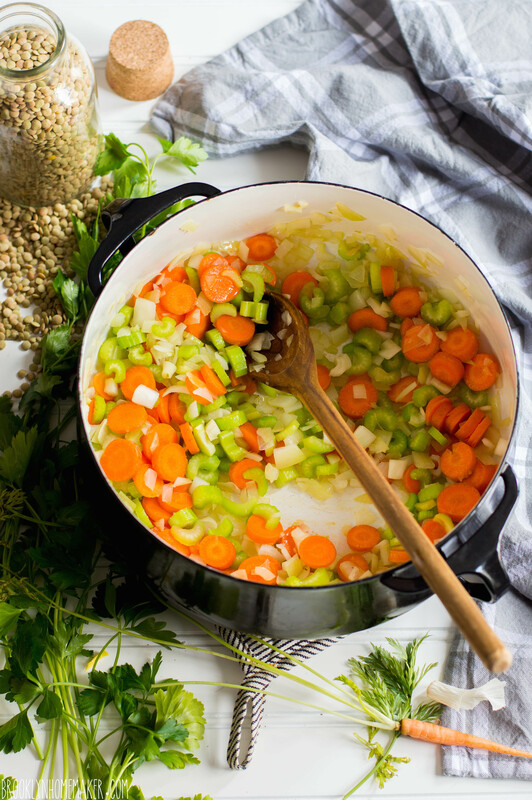 I’m definitely a year round soup lover too, but this time of year I definitely can’t get enough soups and stews and braises. Thank you- and I hope you love the soup! This looks wonderful. As for college and vegetarians; I think there’s an unwritten law out there somewhere that says prior to graduation, you MUST spend at least 5 minutes as a vegetarian. hahahahaha! That definitely sounds about right! I made it about 2 years, and part of that time was spent working as an intern at a restaurant in France. I mourn every day for all the amazing food that I could have eaten but passed on. No way could I have done it in France. Berkeley was a snap – it was more who wasn’t a vegetarian! This is one beautiful bowl of soup. I have only been eating lentils for a couple years and it was love at first bite. Haven’t fallen in love with kale yet though. I’ve been told it depends on the kind you buy? I definitely think buying the right kind of kale helps. For salads or raw eating I think curly kale is great- but for almost anything else I prefer Lacinato kale. It has a much better texture and flavor and holds up to cooking and reheating much better. I don’t think I realized you were a vegetarian, Tux (doh!). I was brought up a lot like you. My mama always “boiled a pot” for supper. It was meat and potatoes all the time, and mostly fried food! 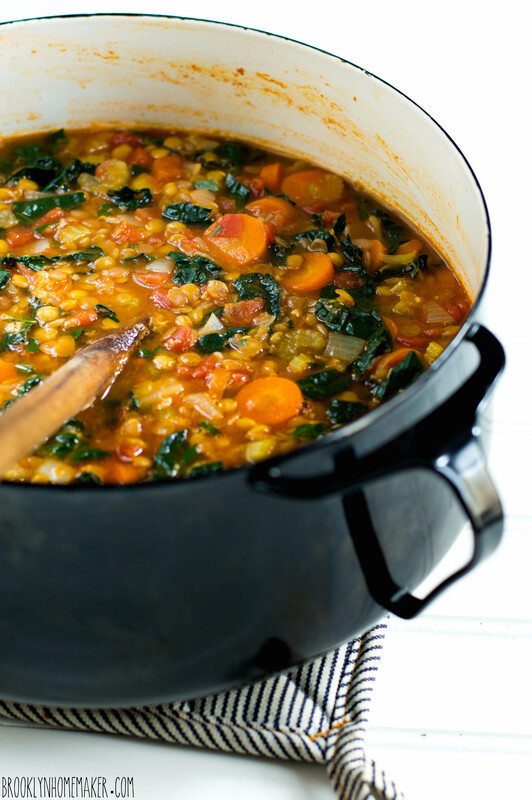 I think this soup has convinced me to try lentils. I haven’t yet and I’m always looking for something filling on Meatless Mondays. Thanks for sharing! Thanks Debbie! 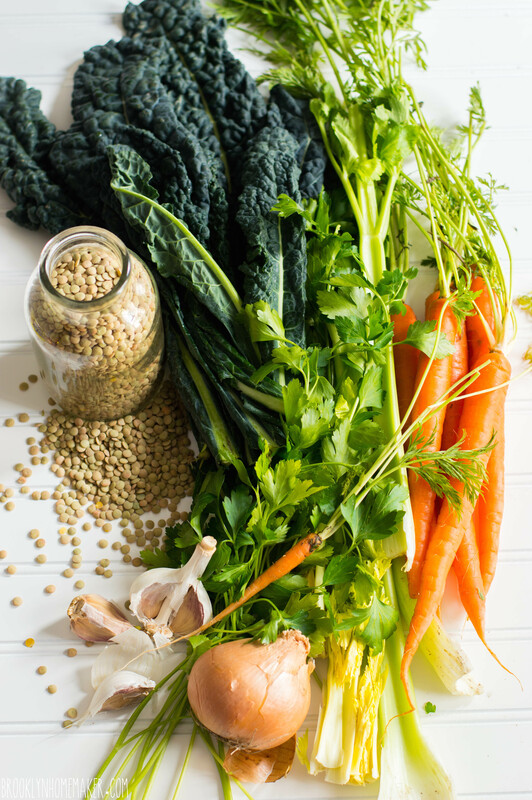 I hope you do give this a try (and love it) for meatless mondays! Thank you so much! My family is actually full of hunters, but I’m definitely not one of them! 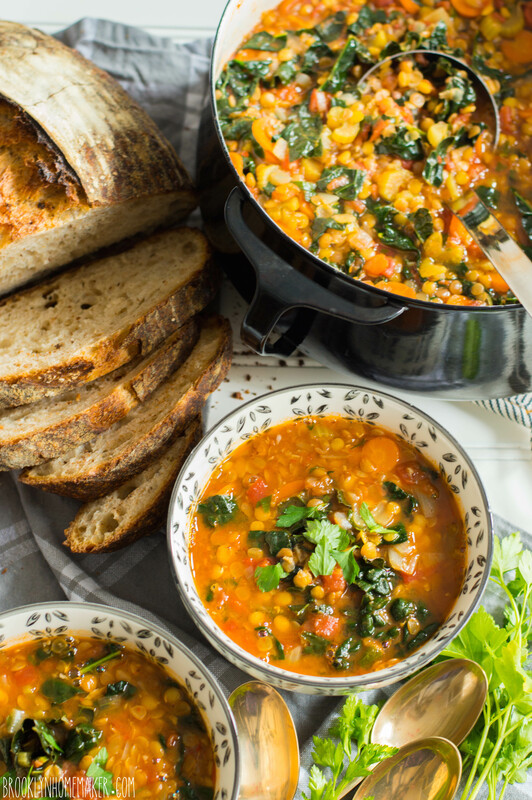 So deliciously hearty and comforting. 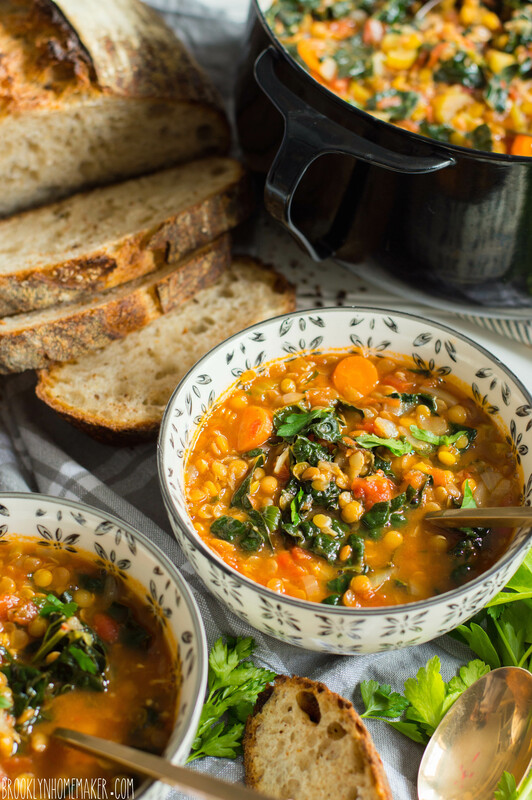 Lentil soup is a fave around here and I love soup year-round. With this weekend’s polar vortex, we have been living on soup and hot chocolate. I do believe I could eat soup every day…every season…any meal. Your soup is just up my soup alley and I will make this for sure. I have what I call my “soup file” and this one is right up on top! Beautiful photos. “dusty old hippies gnawing on sprouted mung beans in some commune somewhere” LOVE it. Classic. I could never be a Vegan because of my love affair with bacon. Simple as that. Not that I have it often, but still. It’s bacon. Come on! This not only looks delicious and hearty but is so good for you, thanks Tux! Hahahaha! I tried to convince myself that I didn’t miss bacon when I was a vegetarian. Then when I started eating meat again and had my first piece I was like WHY??? WHAT WAS I THINKING?? ?